Why is Julius Caesar portrayed as cold and stoic when historical evidence indicates otherwise? Is “All’s Well That Ends Well” a modified version of a lost Shakespearean play, “Love’s Labor Won”? Why does Shakespeare repeatedly stress the fact that Juliet was not quite fourteen years old? How did her youth bring about the catastrophe? These volumes do something thought by many to be impossible—they add a refeshing and novel approach to the already over-crowded shelves of Shakespearean comment. ASIMOV’S GUIDE TO SHAKESPEARE is an objective, scene-by-scene exploration of thirty-eight plays and two narrative poems in terms of their mythological, historical, and geographic roots. 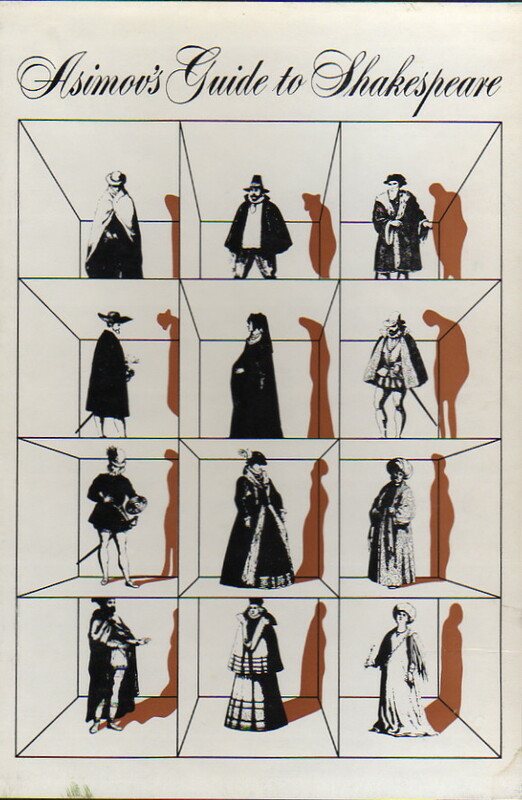 It is not, says Dr. Asimov, a literary evaluation but rather supplies the modern reader with a working knowledge of the topics which Shakespeare assumed his potential Elizabethan audience to be well versed in. 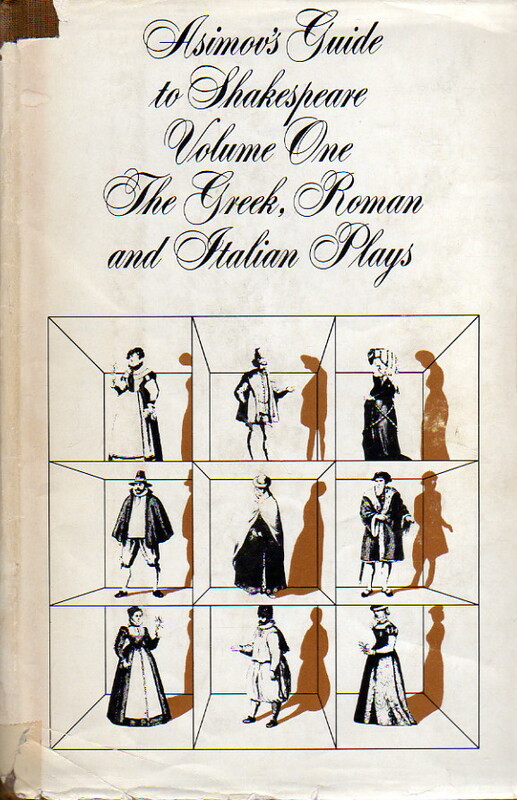 Volume One deals with the Greek, Roman and Italian plays. With a liberal supply of maps, charts and quotations to supplement his text, Dr. Asimov presents the historical facts surrounding each play, while at the same time attempting to account for arising discrepancies. He does not hesitate to regard Shakespeare as fallible and when necessary he points out the English master’s excessive distortion of historical fact. Careful attention is given in each analysis to the maintenance of the story line so that the user of the GUIDE needs only possess a marginal knowledge of any single play in order to ultimately reach a deeper appreciation for the dramatic genius of William Shakespeare. This book is a delight, and ought to be on the shelves of every Asimov fan and every casual reader of Shakespeare. Mind that I say “casual reader.” This book is not a marvelous example of Shakespearean scholarship. Asimov’s summaries of the individual plays are fast and not always terribly insightful. As with Asimov’s Guide to the Bible, however, his purpose here is not to add anything original to what a reader familiar with Shakespeare knows, but to provide general background information about the plays which makes it possible for the more casual reader to understand and appreciate them better. As it happens, Shakespeare’s plays fall into two groups—those that are about English history, and those that aren’t. The latter are covered in Asimov’s Guide to Shakespeare, Volume Two. The remainder are covered here and are divided up into plays with a Greek background, a Roman background and an Italian background. (He sometimes has to stretch a point to fit a play into one category or the other.) The net result is a bit weak from the point of Shakespeare—this is definitely not a good order in which to read the Bard’s works—but provides a more smoothly flowing overview of the background information. Asimov’s style here is clear, his background information on the plays is complete (although it does not include much on the features of the now-antique version of English Shakespeare writes), and very often his little chapters can make a helpful way of quickly getting an overview of a particular play, before, say, going and seeing a performance.